Prerequisite: Introduction to Old Norse or an equivalent course at another institution at the discretion of the course instructor. Old Norse Eddic poetry was collected in medieval Iceland but represents a world literary treasure, capturing a variety of mythic and legendary narratives from early Scandinavia and the wider Germanic tradition. This course focuses on reading selections from this poetic literature in Old Norse, providing students with not only the opportunity practice their skills in translating the Old Norse language, but also to become more familiar with these narratives as both windows on early medieval culture and influences on modern literature and popular culture. 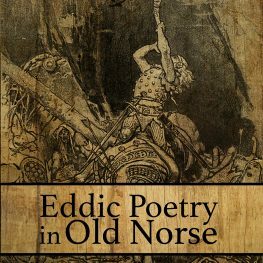 Eddic Poetry in Old Norse meets twice weekly for a two-hour preceptor-led discussion session (four hours total per week).